Television's favorite lifeguards get stylized with Funko Pop Baywatch. The debut set includes two figures from the classic Baywatch tv series. 242 episodes. And, which characters are remembered most from the show? The two featured in the Pop! Baywatch set, of course. 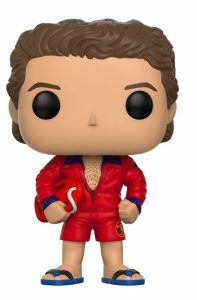 Mitch Buchannon, portrayed by the Hoff, is wearing his red lifeguard shorts and jacket, which is halfway unzipped so his manly chest hair can be seen. Mitch, with his perfectly coiffed brown hair, is also shown sporting flip-flops while holding onto his rescue board. Pamela Anderson was C.J. Parker for five seasons and her figure is a mirror image of the blonde beauty. Parker is posed wearing the signature red one-piece swimsuit. Her long, wavy hair stops just below her hips and is parted in the middle. 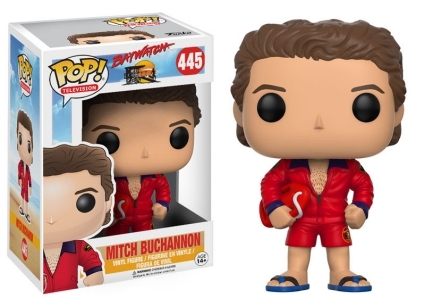 The 3 3/4" Funko Pop Baywatch figures are part of the Pop! Television line, which is reflected in the numbering. Funko pop Baywatch set Brand New great for collecters!